Cedarlane is Canada’s most trusted Source for Science. Starting from a small operation and growing into a Canadian brand that life science researchers and clinicians can trust, we are always looking to provide you with great service and unmatched value. We want to thank all of the Life Science researchers and clinicians throughout Canada who have become our loyal customers and members of what we call our Cedarlane family. We treasure all of the wonderful relationships that have developed between us throughout these many years. Thanks to our customers, Cedarlane has evolved from a manufacturer of immunology reagents into a major supplier of life science products. It’s been a fabulous journey. BACK BY POPULAR DEMAND! You talked and we listened! Our online entry codes were such a success for our 60th year celebration during 2017 that we decided to bring them back for 2018, and now again for 2019! 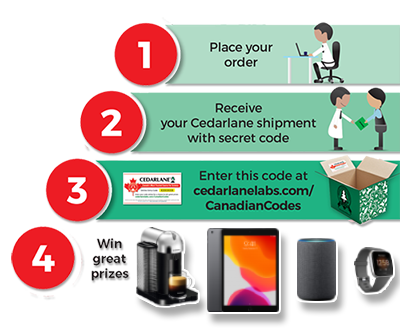 Each and every Cedarlane product shipment throughout the year will contain a Canadian Code, which can be entered into our quarterly grand prize draw sweepstakes! Once again we have some tremendous prizes to raffle off – see below for full prize information. Make sure to enter your codes all year long – the more codes you enter the more chances you have to win! Attend the next big life sciences/biotechnology industry event! We’re sending one lucky scientist to a trade show of their choosing with a $1000 CAD registration fee/travel voucher. Want to head to Chicago for Neuroscience 2019? Looking to participate at AAI 2019 in San Diego? Cedarlane can help get you there! Simply enter your Canadian Codes by March 31st to be entered. Remember: the more codes you enter, the more chances you have to win! Please note that this travel voucher can only be used towards registration for a specific, pre-approved event, and/or flight charges to and from the event. Prize Draw 2: Coffee In The Lab! Take your lab’s water cooler talk to the next level! At Cedarlane, we understand that there are long nights and early mornings in the lab. We’re here to help! This prize pack includes a brand new Nespresso coffee machine! Since 1986, Nespresso has redefined and revolutionised the way millions of people enjoy their espresso coffee. Cedarlane is helping you and your lab join the movement. Make sure your lab submits all of your codes before the deadline. Treat your lab to a pizza party, on us! At Cedarlane, we understand how busy things can get with grant proposals and research projects in a deadline-driven environment. That’s why we’re thinking of you with this prize pack! Plan a Boston Pizza pizza party and enjoy some mouth-watering food. With a $500 gift voucher, you’ll have plenty of room to try your favourites! Make sure your lab submits all of your codes before the deadline..
Stay even more active, healthy and conneted! Been wanting that new piece of technology that will help you stay organized, help reach your fitness goals, and more? We’re here to help. Click here to download the Terms and Conditions of this promotion.